Dunsfold is a very small village in the borough of Waverley in West Surrey. It’s well known for the Dunsfold Aerodrome, an airfield that was built by the Canadian army during World War II. Hundreds of years ago, members of the English aristocracy held large estates of land in and around Dunsfold – and several historic cottages still exist in the area. A customer of mine had recently bought one of these cottages and, during renovation work, had removed the downstairs carpets in three rooms to discover a Quarry tiled floor. Naturally, they were caked in many years’ worth of muck and carpet glue. It would be a significant job to get the tiles in the three rooms back to looking their best – but it was a job I was more than willing to undertake. Classic Quarry tiles exude a certain rustic quality and charm – a welcome addition to many vintage properties, especially those located out in the countryside. 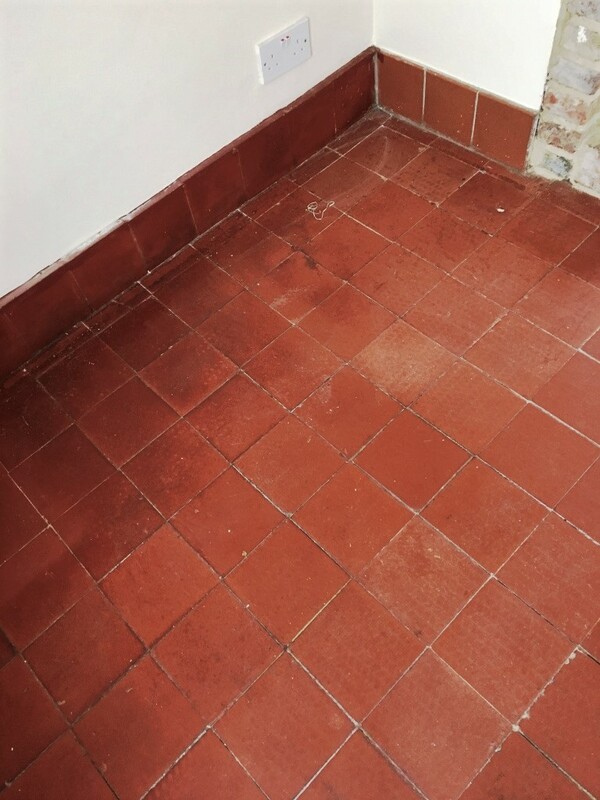 I started the restoration by soaking small areas of the floor in Tile Doctor Remove and Go. This product is excellent for removing floor coatings such as old sealers as well as shifting stubborn filth and loosening carpet adhesive deposits. After carefully scraping any excess adhesive off manually with a sharp blade, I ran my buffing machine across the floor and immediately the tiles cleaned up well. Next, I used a 200-grit (Coarse) diamond-encrusted burnishing pad on the floor. This basically skims a layer off the tile surface, revealing the original colour of the stone that had previously been hidden underneath. A small amount of water was used as lubrication for this process. Quarry tiles are naturally very porous so after rinsing the soil off the floor I left them over the weekend to dry. While the somewhat aggressive approach of burnishing is highly effective, it can leave the tiles looking a little washed out – and the colour slightly diminished. However, I assured the customer that the colour would return once the tiles had been sealed. While I was enjoying my weekend off, the customer fortunately found a few replacement Quarry tiles in his attic to fit around the fireplace as upstands where there were some tiles missing. So, on my return to the property my first task was to fit these replacements, before sweeping the floor clear of any debris. 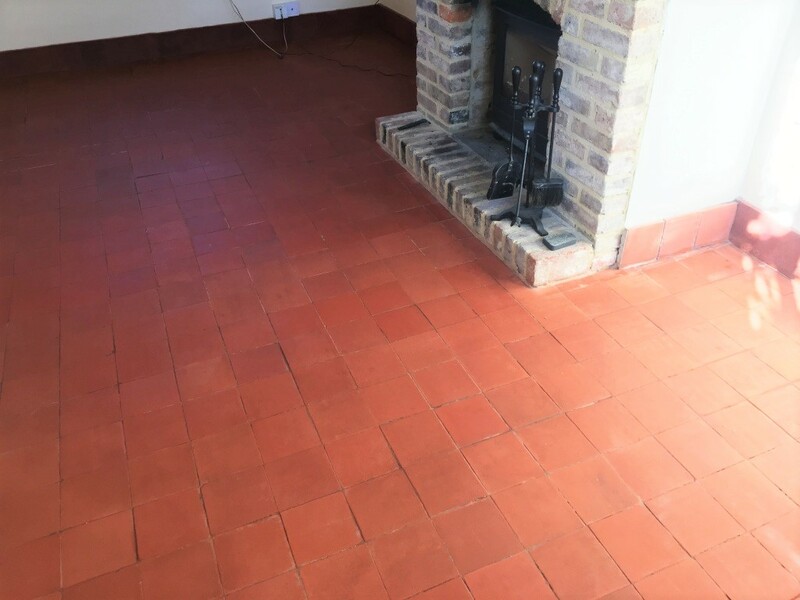 To finish the restoration, I applied a couple of coats of Tile Doctor Colour Grow, an impregnating sealant which provides the matte, natural-look finish the customer wanted. This sealant penetrates into the pores of the tile, so it dries inside the stone not on the surface. It also intensifies the fantastic red shades in the Quarry. Around an hour after the coats of Colour Grow had been applied, the floor was dry and free to be walked on, and all the furniture could be returned. Much needed life and character had been restored to the Quarry tiled floor and the new property owner was very happy as a result. 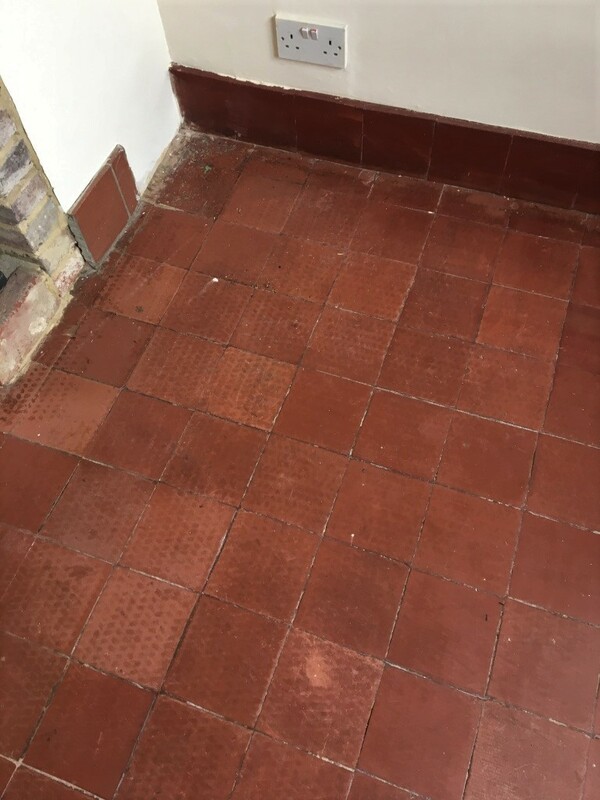 This entry was posted in Work History and tagged carpet adhesive, Dunsfold Tile Cleaning, Dunsfold Tile Sealing, quarry tile cleaning, quarry tile restoration, Quarry Tile Sealing by AbzDominise. Bookmark the permalink. There are more than 50 Tile Doctors operating throughout the UK and are able to help resolve any problem you have with your Tile, Stone or Quarry whether its Internal or External. Call us today on 0345 512 0122 and ask us to help you with your problem large or small.